Beltsville, MD, September 28, 2011 — Empress Software, developers of the robust, agile Empress Embedded Database, announce a new, dynamic, database driven website powered by Empress for the Athenians Project. Athenians Project is a multi-year, ongoing project of compiling, computerizing and studying data about the persons of ancient Athens. The project is headed by Professor John S. Traill, a world-renowned antiquities expert as well as instructor in “Latin and Greek Scientific Terminology” at the University of Toronto. Following in the footsteps of the great German scholar Johannes Kirchner, over 100,000 entries of age-faded, handwritten card-files collected since the early 1930s by classics scholar Professor Benjamin Dean Meritt and his associates at the Institute for Advanced Study in Princeton, about persons of ancient Athens, have been digitized and maintained in an Empress Embedded Database for over 30 years. 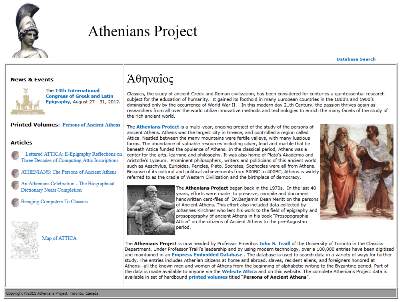 And now, about 10,000 entries under Beta, Gamma and Delta databases, are made publicly available on http://atheniansproject.com - the Athenians Project website driven by Empress Embedded Database. Empress Embedded Database makes web development and data accessibility fast, easy and reliable for dynamically driven web based applications. an arsenal of Empress Tools, Athenians Project developers got the website up, ready and available to the public, quickly and efficiently. For the past 30 years, data entered into the Empress databases has been in transliterated Greek text. With EMPRESS Persistent Stored Modules (PSM), the data displayed on the browser is now decoded and converted to ancient Greek. This feature is implemented as a persistent stored module SQL function and hence it can be stored on the server and be invoked from the client. “Since the computerization of Meritt’s data more than 3 decades ago, EMPRESS has been the most important factor in our success," states John Traill, head of the Athenians Project. " A half century earlier, even Albert Einstein, one of the most profound intellects in human history supported the project ab initio. Both Einstein and Meritt were original members of the Faculty of the Institute for Advanced Study at Princeton. Now that's class!" With the advent of digital information systems, a well designed database and the Internet, the production of making Athenians project information available to the general public is no longer confined to 63 pounds of 20 hardbound printed volumes. Athenians data stored in the Empress database can now be easily accessed via any web browser, anywhere. This includes PC’s and handheld devices such as the Apple iPad running iOS or Motorola Xoom running Android. searches are now done in a snap. Empress Software develops and supports the EMPRESS Embedded Database management system worldwide. EMPRESS is a full-featured, high-performance database designed for embedded developers working with Android, iOS, Linux, Windows, UNIX and real-time operating systems. EMPRESS has been utilized successfully in diverse embedded fields including acquisition & instrumentation, networking & telecom, control & automation, automotive, security, and military & defense. For more information, check our web site at or send e-mail to info@empress.com or call Empress at 301-220-1919.